Morgan Bulkeley and Harry Wright were integral parts of the early days of professional baseball in the United States. Bulkeley serving as the first President of the National League in 1876 and the founder of the Hartford Dark Blues baseball club, a member of the National Association of Base Ball Players. As the president of the NL, Bulkeley worked to clean up the league, working tirelessly to limit the vices that permeated the young sport, including drinking, gambling, and unruly crowds. America’s game of baseball, the game we know and love today, was brought to the masses by Harry Wright, the man who was a pioneer in the development of the game from the early years. One of the many facets of today’s game which Wright developed was the act of keeping score. Wright even developed the first score book, aptly named “Harry Wright’s Pocket Base Ball Score Book,” a 48-page tome with room to score 22 games. 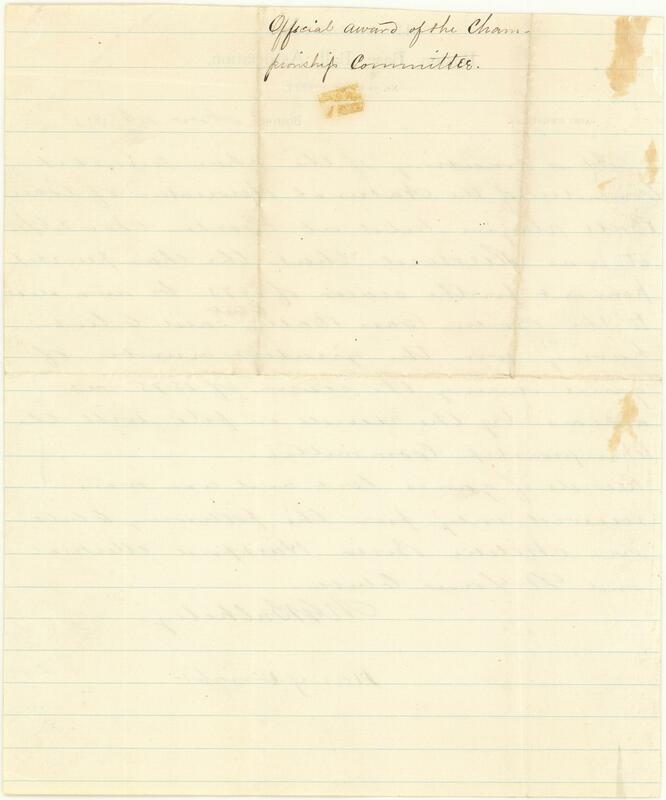 In November of 1875, November 26th to be exact, a letter was handwritten on “Boston Base Ball Association,” letterhead that was signed by both Morgan Bulkeley and Harry Wright, the Hall of Fame manager of the Boston Red Stockings. “Harry Wright, Sec’y.” is printed in the upper left corner and “Boston, 18” with “Nov 26” hand written after “Boston,” and “75” hand written after “18”. 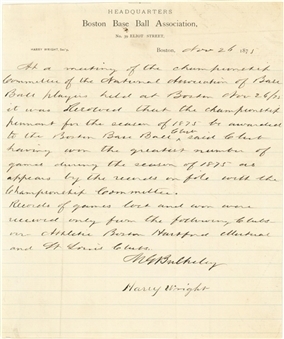 The handwritten letter reads “At a meeting of the championship Committee of the National Association of Base Ball players held at Boston Nov 26/75 it was Resolved that the championship pennant for the season of 1875 be awarded to the Boston Base Ball Club (inserted) said Club having won the greatest number of games during the season of 1875 as appears by the records on file with the Championship Committee. Records of games lost and won were received only from the following Clubs (sic) Athletic Boston Hartford Mutual and St. Louis clubs.” The Boston Red Stockings of 1875 truly earned the pennant, finishing with an otherworldly 71-8 record, 18.5 games ahead of Bulkeley's Dark Blues. 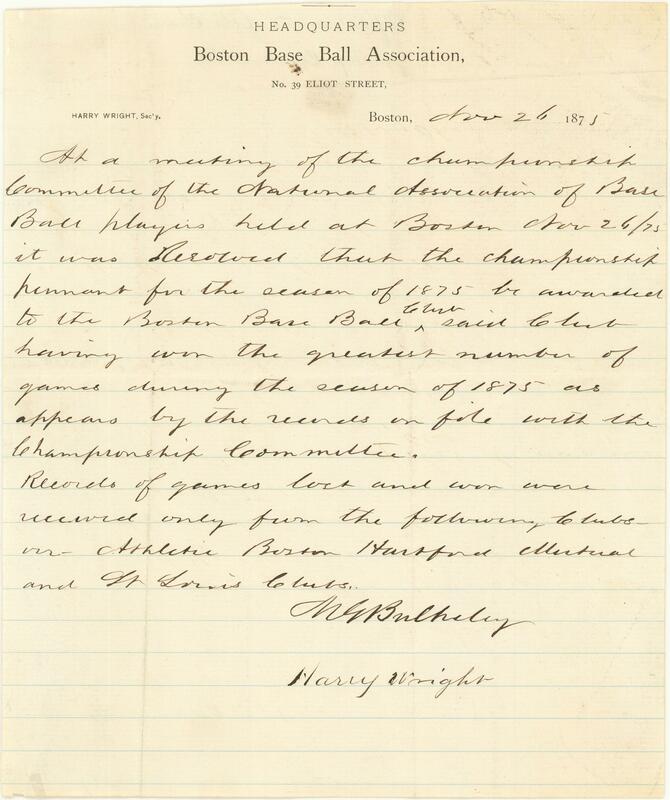 This letter is official confirmation of their pennant, which occurred in a season that saw numerous teams fold in the final season of the National Association. Bulkeley signed his name first and Wright signed his name below Bulkeley’s. Bulkeley's signature is of remarkable quality, and represents one of the finest examples of the signature of the former senator and governor, one of the most important men in the history of the National League. The letter is in exceptional condition, with trace evidence of two horizontal and vertical folds consistent with being placed into an envelope. 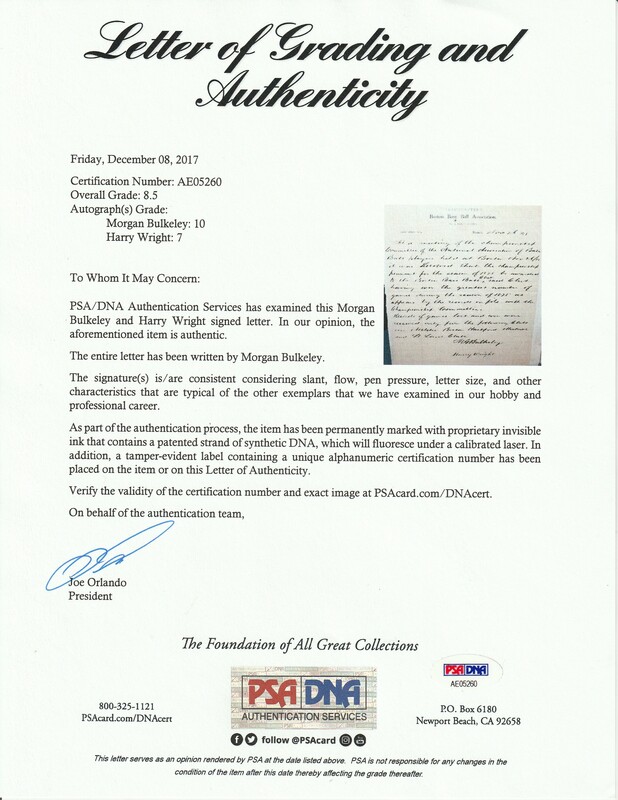 This item comes with a LOA from PSA/DNA, who have graded Bulkeley’s signature a GEM MINT 10 and Wright’s signatures a 7, with an overall grade of Near Mint 8.